These instructions and information belongs to the Symbol Circuit Editor. The center marker with symbol placeholders. The "Meettechniek Symbol Editor" is the custom symbol drawing tool what goes with the Online Circuit Editor. With this tool new symbols can be created and excisting ones can be modified. The center marker indicates the 0,0 coordinate. This is also the point around which the symbol rotates when it is placed in the circuit-editor. Next to the centermarker are four label placeholders which can be relocated by dragging them. Be aware that these can't be filled in here. There are 9 basic scapes that can be drawn: line, polyline, polygon, rectangle, circle, ellipse, arc, cubic bezier and the quadratic bezier. After selecting the shape can be drawn by clicking and/or dragging. Each drawing step is explained in the statusbar on the bottom of the screen. With selecting a shape a dialogue menu pops up. 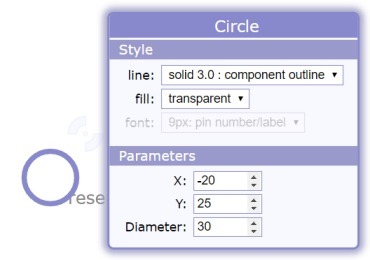 In this menu the line and fill style can be selected, and the physical parameters can here be modified. A wide range of solid line widths can be selected as well as a couple of pattern lines. 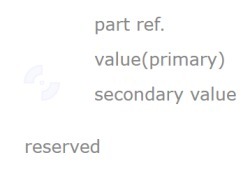 To get more consistancy in the symbols some lines are marked with their usage. Use fill: transparent for the main shape of the symbol. In this manner the symbol can be selected by clicking inside the symbol. When drawing wires whose function is being a terminals in the the circuit editor, be sure that they are fixed on a 5*5 grid so that they will propper align to wires when placed in the Circuit Editor. One can ensure this by turning the grid button on. Pin numbers and labels can be added with the pin-tool. To edit an already placed pin number or label, select the pin-tool and click on the text. Shapes, pin numbers and labels can be selected when the select tool is active. A group of shapes can also be selected by dragging over the drawing area with the left mouse button hold down. Multiple (group of) shapes can be selected by holding the <Ctrl> key down. Zoom-in, zoom-out, zoom-all and drag buttons. While the zoom-in and zoom-out tool is active, one can zoom at a specific area by clicking there. By clicking the zoom-all tool all the elements will be made visible within the drawing window. The drag-tool is used to drag the drawing in the window. Zooming can also be done with the mouse scroll wheel. Select shapes, pin numbers and labels left mouse click or drag with left mouse button down. hold down <Ctrl> to select multiple sections. Select tool must be active. Delete <Delete> or <Backspace> Selected drawing section. Symbols can be loaded from the standard symbol directory or earlier made custom symbol directory. But symbols can only be saved in the custom symbol directory. Within a drawing multiple symbols can be loaded. Unwanted or no longer used costum symbols can be removed with the cleanup tool. Raw symbol files can be imported or exported. 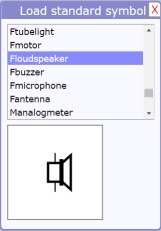 This is usefull when symbols must be shared with other users or computers.